Note: This entry, posted to Yoani's blog in 2007, describes how she managed to return to Cuba from Switzerland, and regain her citizenship. Once the decision was made to return to the Island, we bought roundtrip tickets, sent our passports to the Cuban consulate in Bern to get the authorization stamps, and took a plane with a stopover in Paris. At the Cuban airport we got the usual questions about the reason for our trip, to which my son and I responded with the learned script, "We have come for two weeks to visit family." In the scant twenty kilos of luggage we had all of our personal belongings, having made sure that none betrayed that this was a journey of no return. The two weeks defined by our tickets passed, and I am sure our names echoed on the loudspeakers of the Jose Marti airport, though we did not arrive to occupy the seats we had bought. I began the search for information, to know the risks and possible results of a "rage to stay." Everyone I asked about whether they knew of any other case that could serve as a guide to me, opened their eyes wide and told me, "You are crazy." So yes, an unusual madness, little seen, rarely documented... but delirium for a reason. My friends thought I was joking, my mom refused to believe that her daughter no longer lived in Switzerland, the land of milk and chocolate, and my neighbors thought Mata Hari had returned from Europe. The key was given to me by someone I bumped into: "The only thing you have to do is destroy your passport. Without a passport they can't force you to get on the plane." With this act I could experiment, for a few months, with what it's like to be undocumented in your own country. On August 12, 2004, I presented myself to provincial immigration to announce, "I am me, even though I do not have the documents to prove it, and I have come to stay." What a surprise it was when they told me, "Go to the end of the line for 'returnees' and tell Lieutenant Sarahi to give you the form for getting an identity card." And so I soon met other "crazies" like myself, each one with a horrifying story of return. One gentleman who was returning from Spain with his wife and daughter, after living there five years, told me, "Don't worry, they will try to force you to go but you can refuse. The worst thing that can happen is that you will be detained for two weeks, but the jail is right here and the mattresses are the best." I breathed easy... at least sleeping was guaranteed. They made a "stayed behind" file for me and warned me that "never again would I return from leaving the country," and that they were being lenient with me because I had a son to care for. I didn't get to try the famous mattresses because I couldn't keep a minor of that age with me, nor could I leave him in the street. The key that "greased the skids," was the fact that I did not have any property--which would have been confiscated when I left (who in Generation Y owns any property in Cuba?) --and moreover I could count on being welcomed back into the nuclear family where I had lived before. Every week I had to present myself at Immigration for a routine check, until October 2004, when they issued us new identity papers. The ration quota was returned to us in the middle of December... and everything was back to the way it was before. I don't tell this story to explain what many still see as a senseless act on my part, but rather to tell those who at times thought to do it, it is possible. It is neither so unattainable nor so unusual as the entangled immigration laws and decrees would have us believe. For months, from Zurich, I surfed the internet looking for some testimony that would tell me, "you can," but I found only words of surprise, suspicion and denial. So, thinking about other demented people, like myself, who are considering the idea of coming back to stay, I have written this "Chronicle of a Return." 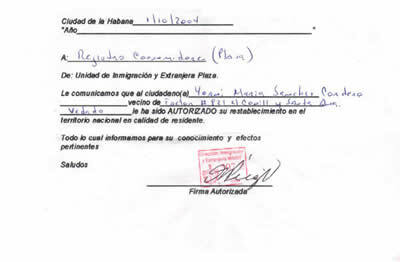 *Translator's note: Cuban citizenship and travel laws are too complicated to explain here in full. Briefly, however, a citizen who leaves the country and doesn't return within eleven months, without making special arrangements to stay away longer, essentially forfeits their Cuban citizenship and is not legally entitled to return. Unless they are a citizen of another country, they will have become stateless.